Hello awesome friends, and welcome to Trash-to-Treasure Tuesday! Ya’ll know this day is one of my favorites since four of my talented friends are sharing makeovers today too. Be sure to look for links to their projects at the bottom! Now that we have sold our old house, we can start working on our lengthy list of projects that have been put on hold for our new house. One of those projects is adding some curb appeal to the outdoor space. 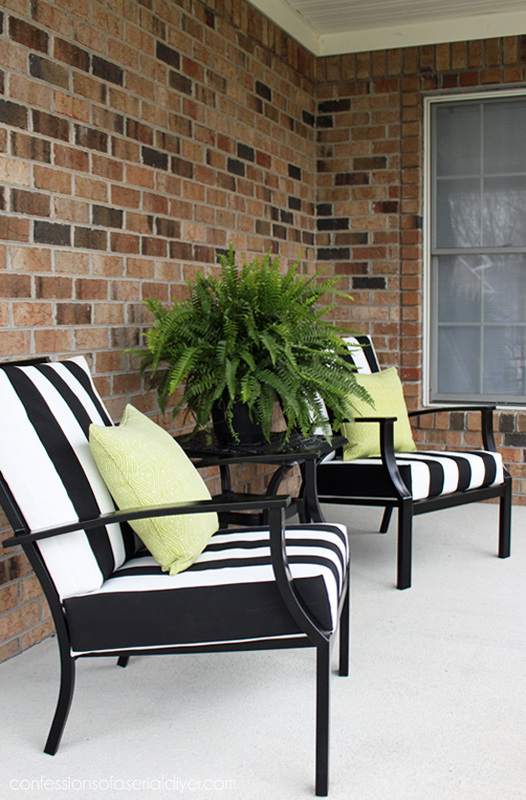 While the weather hasn’t really been cooperating in order for us to start on our landscaping (our main project for Spring/Summer), I have been able to start working on decorating our front porch! They look so bad here! I swear they still looked great at the end of last Summer when we put our house on the market. 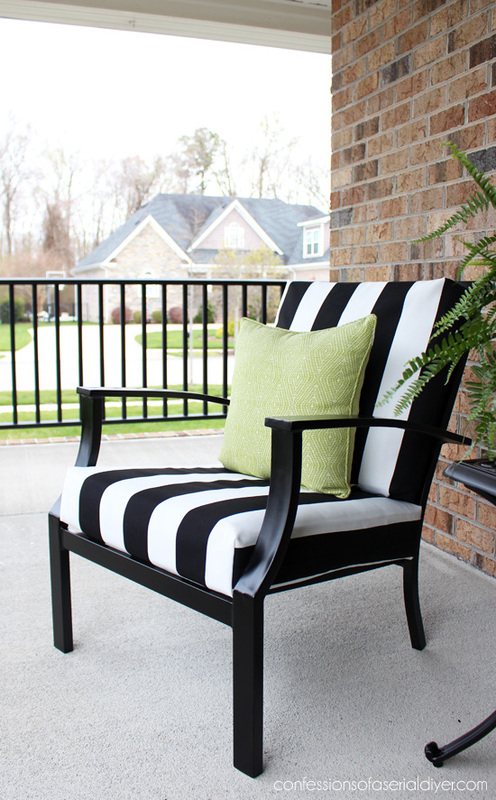 We have a nice large space on our new side porch and since I already have these and since they are FREE…I decided to make them work as a sitting area for that space. And I do believe I turned this trash into treasure! They look brand spankin new! I bought this set 11 years ago. These chairs originally came with a loveseat, a coffee table, a bench, and a table and four chairs. I bought the set at Target and it was white with light green cushions. I had a pool at that house and it was perfect! When I married my hubby, I sold my house and brought this set with me, but the white stood out like a sore thumb in his back yard, so I spray painted it brown and recovered the cushions. Every year they get a fresh coat of spray paint and every two to three years, I have recovered the cushions to make them look like new again. 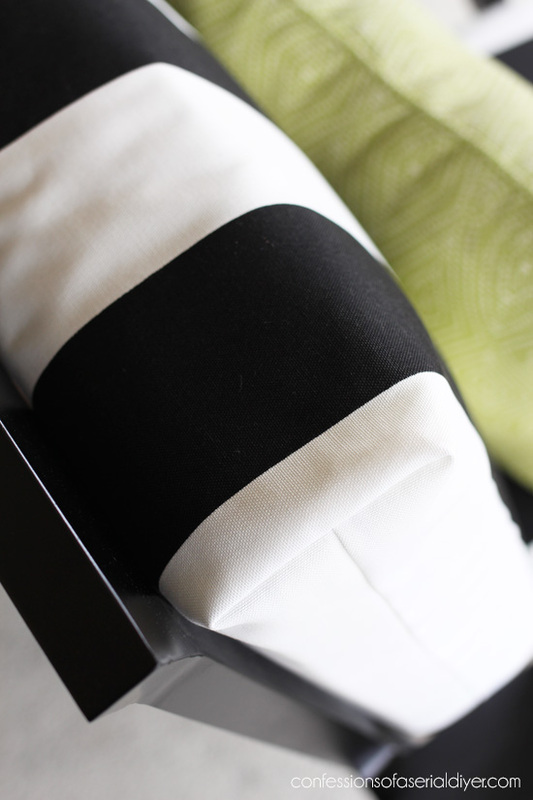 Find my Sew Easy Outdoor Cushion Cover Tutorial HERE. 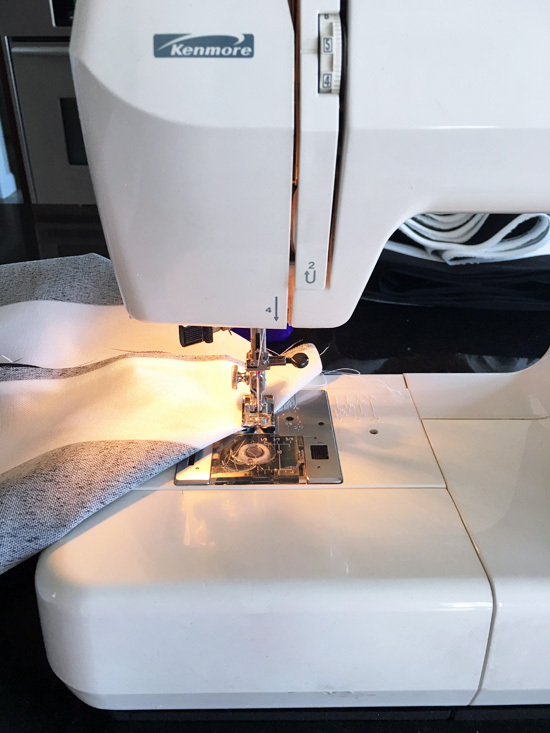 It really is SO super easy to recover your cushions even if you have the most basic sewing skills, and so much cheaper than replacing all the cushions. 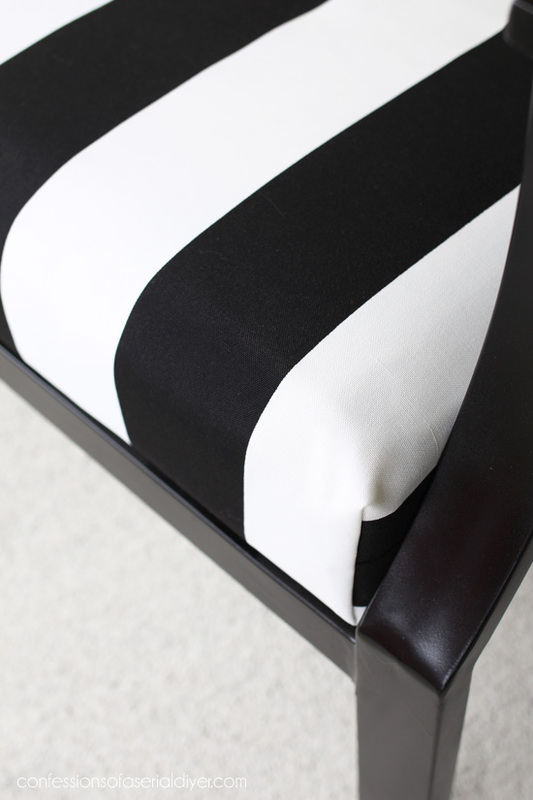 Seriously, if you can sew a straight line, you can do this! I found this fabric at JoAnn Fabrics. 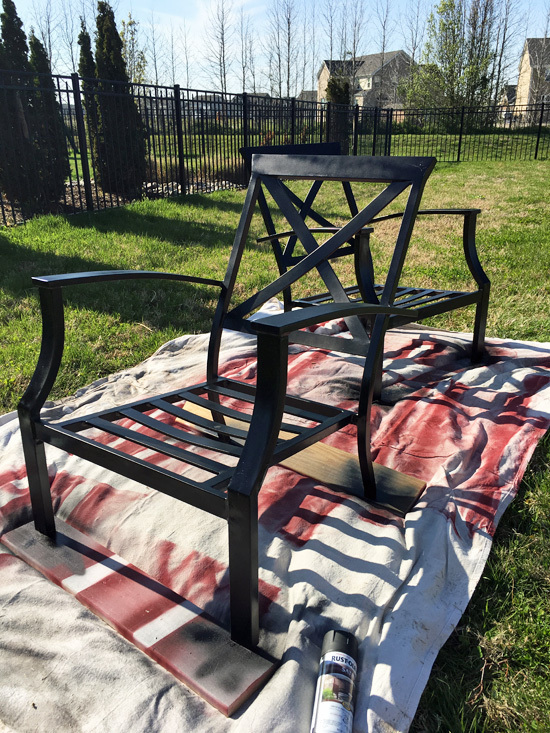 Rustoleum is my favorite spray paint to use and it is perfect for all types of outdoor furniture! That’s one more project checked off the to-do list! I still have the loveseat to this set, and I am debating whether or not to redo that as well and add it to this seating area. The dining table finally kicked the bucket when a nor’easter flew it over our deck last month, so I broke down and bought a new set for our back deck. I had to order it so I’ll share it when I get that space all set up. Grass: check. Landscaping: not so much. That crazy wind also sent our trampoline through our fence, into the neighbor’s window, and barreling down the street! Thank goodness I was home, and two of my neighbors were sweet enough to help me wrangle it back into the back yard! It is totaled, and since Santa brought it for Christmas, we told Brennan he might need to write Santa and see if he’ll send a replacement. 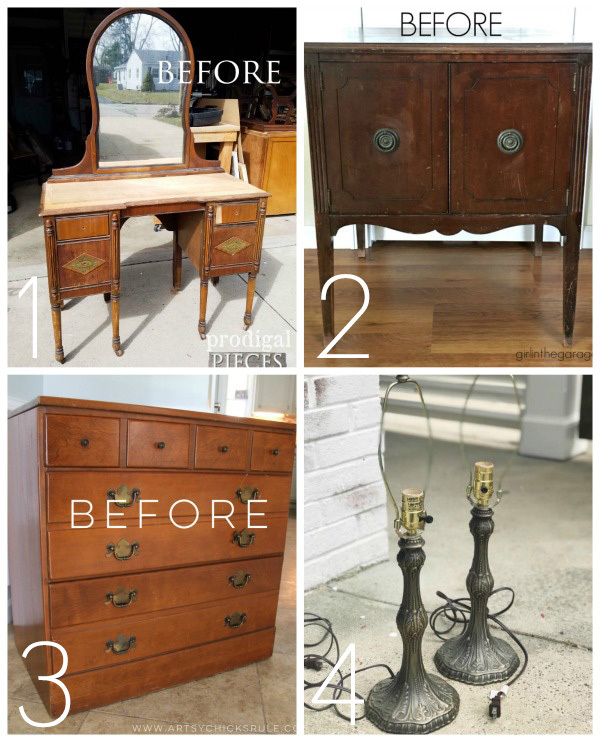 Don’t forget my Trash-to-Treasure girls are sharing awesome makeovers today too! UPDATE: See how this $5 find looks now HERE! Wow! Those sure did get faded, but the look fantastic now, Christy. Thanks for sharing your tips and tutorials! Another wonderful makeover Christy. Love the bold stripes. They really make a statement on your porch. They look great, Christy! I am so glad that you sold your house. What a relief! 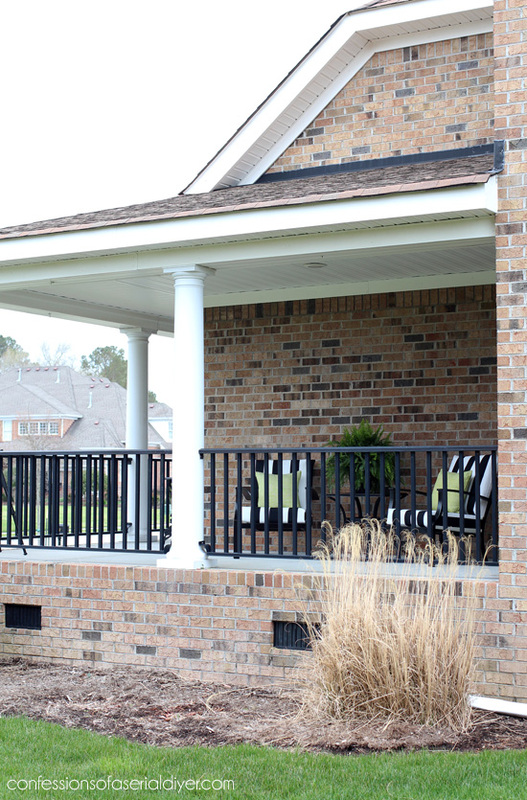 I look forward to seeing more of your outdoor projects this spring. Christy – you are the best chair lady ever!! 🙂 So pretty! So sorry about the trampoline – glad no one was hurt – wind is a scary thing! How timely is this post!! 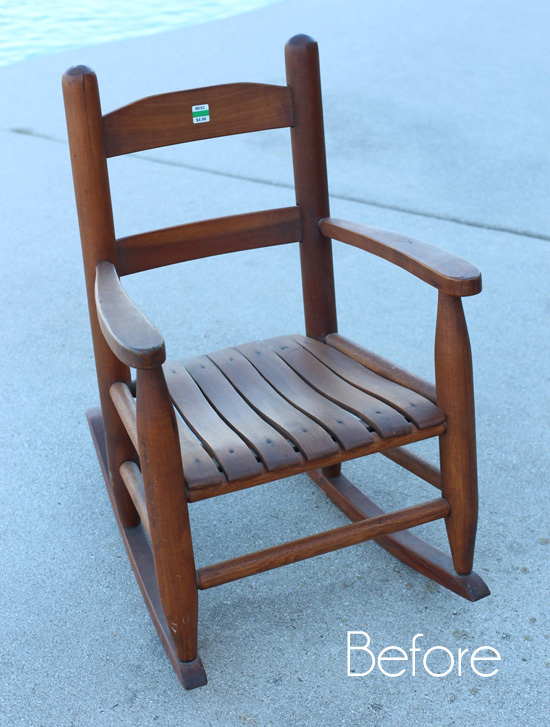 We have a set of porch chairs that are in great need of a paint makeover. They are at least 10 years old and have a dark green finish. You’ve given me the courage to give them a new life with paint. Thanks! Christy, this is fabulous! You are truly a magician. Those patio sets are so expensive- what a brilliant way to make them last for many years. Oh, those look fantastic Christy! It’s surprising what a little paint and fabric can do. 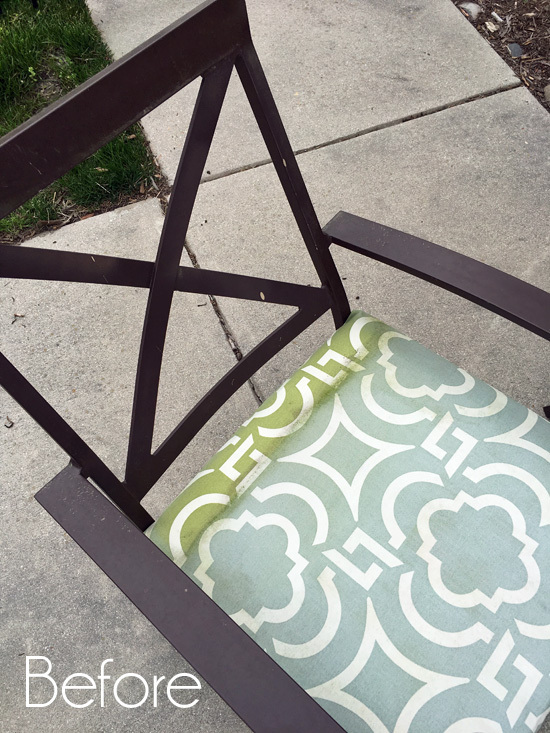 My sofa and side chairs from my mom got a coat of paint last year to match an outdoor table and swing I bought. It’s so nice to have everything matching! Too bad about your son’s trampoline. I’m sure Santa will agree. Right now we have a light dusting of snow, but they say it’s supposed to warm up this week. Keeping my fingers crossed. I’m a little tired of snow. Perfect! 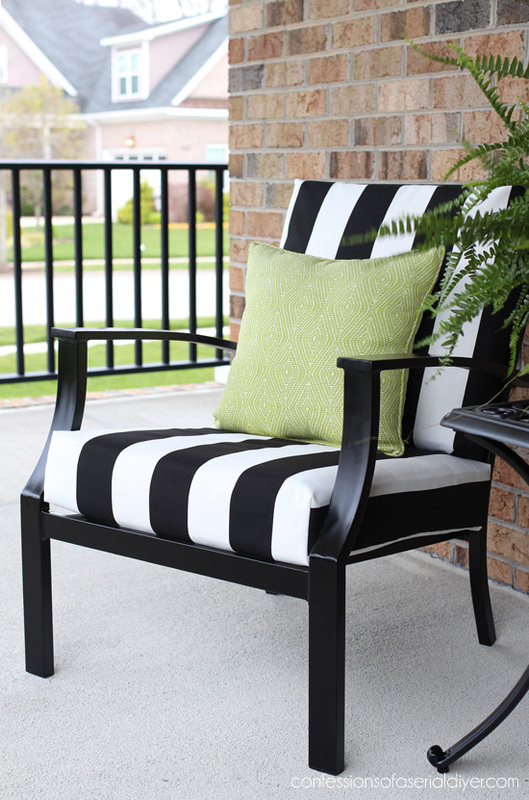 Outdoor furniture can be ghastly expensive and if it can be salvaged, so much the better. You did a fantastic job! They look better than new! I say go for the loveseat, too. I have a similar set from Target almost 20 years ago. Thankfully, the table is still with us, despite landing glass-side-down on the grass after the recent winds. Hello, very classy! Did you sand or rough up the frame before painting? Assume it is heavy gauge aluminum or a heavier metal? And I think JoAnns sells Sunbrella fabric that is fade resistant. You say the recover is so easy, do u have a link to how you did it? Are they envelope closed or have zipper? Or are these not removable? I am looking at a set of chairs from a friend but no cushions are included, so wanted to see how “cheap ” it is if u have to buy the cushions as well as fabric. 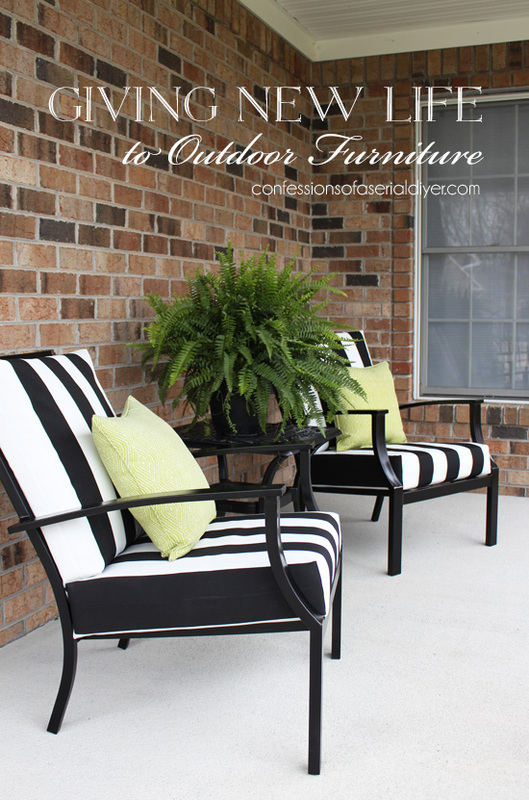 What a wonderful way to improve your outdoor furniture. 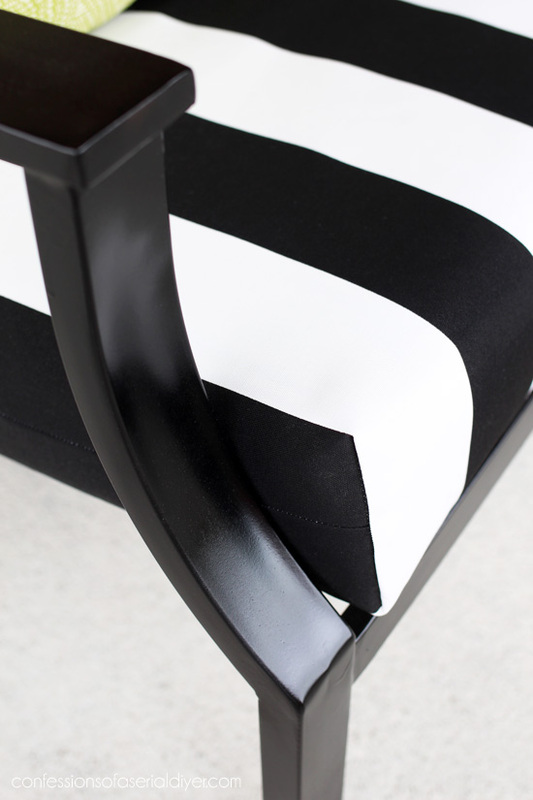 Love the satin black paint which adds just the right sheen, and the fabric really pops. Really love the table and the beautiful fern you put with the chairs, too. Great job! 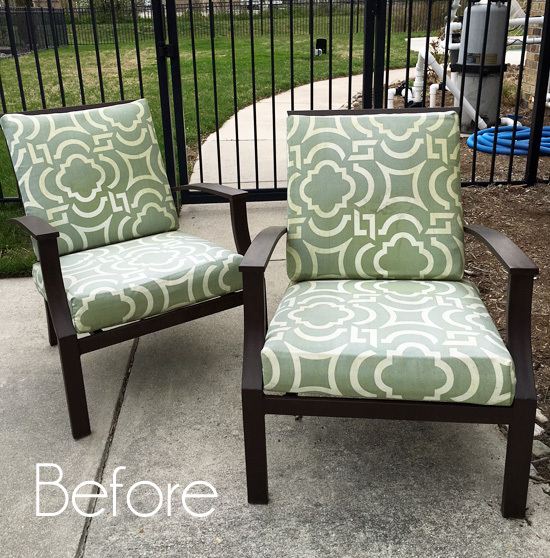 A wonderful refresh for the look of the chairs! Those chairs are stunning!! I love the color of the pillows! Do the loveseat😁!! LOVE the fabric you chose, Christy! 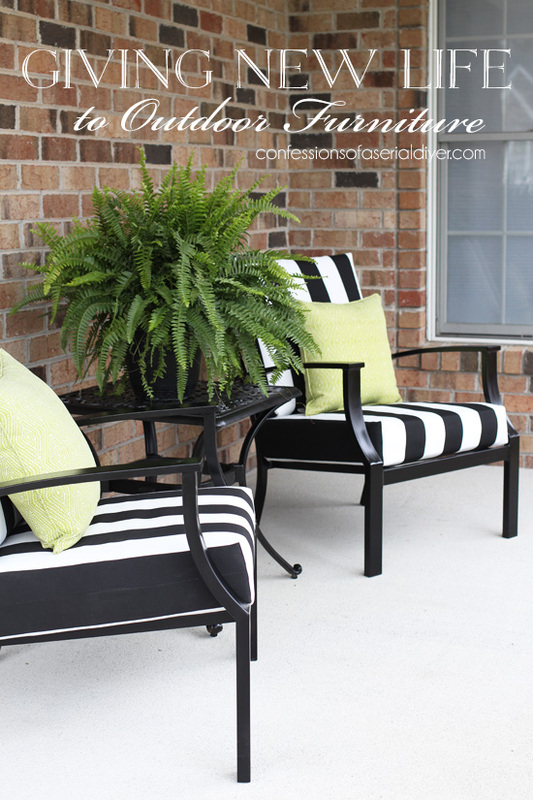 And the green pillows are the perfect accent! They turned out great! Sorry about the storm that trashed the trampoline, etc. Those spring storms can be intense! And you’ve reminded me, I need to repainted my chairs and table. Oh boy. Not something I’m looking forward to but I need to do it! Here’s to checking off the list! I really like them in black & white, they just pop! I remember your tutorial on how to recover them and this reminded me to share that with my sister who has the very same set and wants them refreshed. Wow, sounds like quite the gale force winds! Did your neighbor’s window break? Those are stunning!!! And they look professionally done! Makes me wanna go try and redo ours! Wow! WHAT a makeover! Your chairs look fanTAStic! i need the motivation they provide. My cushions need recovering this year, and now I’m thinking a little spray paint might not come amiss… Beautiful! 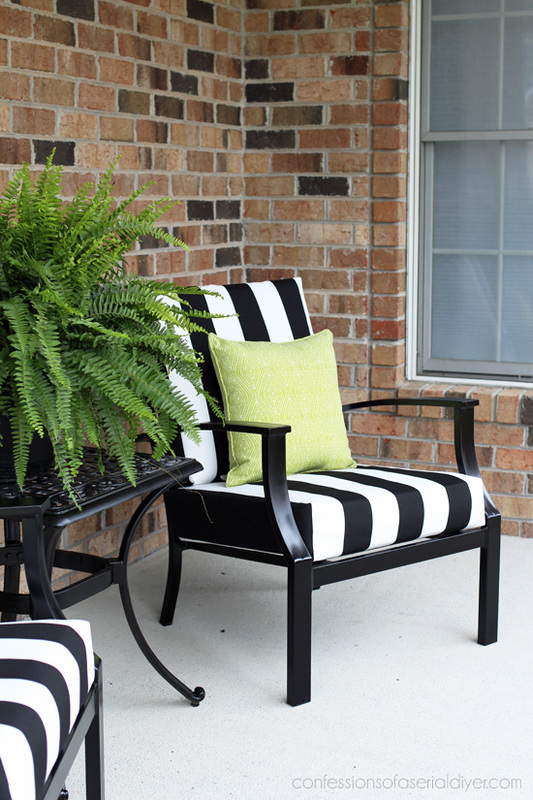 finish the love seat the same and place it on the porch on the left side (according to the picture) and add 2 small tables one on each side…this will take the eye around the porch and make it look cohesive , dont forget the pillows !! !